I’m going to throw in a couple of tips before I give you this awesome recipe. 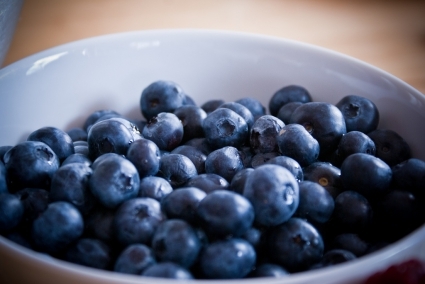 If you use frozen blueberries, take them out of the freezer, put into a colander in the sink and let them thaw. I gently ran cold water on them several times to remove excess coloring from the blueberries. Then I spread them out on a few layers of paper towels to dry off a bit and for the paper towels to absorb more color from the blueberries. By doing this, you should avoid the funny coloring of the batter that can occur once your muffins are baked. When you do add the blueberries to your batter, do so VERY gently with a spatula. Carol Bray, Original came from Sweet Little Baker, but I've tweaked it. Preheat oven to 425 degrees and lightly grease or line a 12 cup muffin baking pan. Prepare the streusel topping in a small bowl and set aside. Mix the flour, baking powder, baking soda and salt in a large bowl. Set aside. then add the milk and vanilla and mix again. Add the wet ingredients to the dry and GENTLY combine using a rubber spatula until everything is moistened. It will be lumpy, don’t worry about that. Then VERY GENTLY, fold in the blueberries. DO NOT OVER MIX! Fill the muffin cups to the very top. Then crumble the streusel topping over the tops. Bake for 5 minutes at 425 degrees. Leave the muffins in the oven and after 5 minutes, reduce the heat to 375 degrees and bake for another 15 minutes. Thank you Michele! I hope you love them like we did. Now, this definitely caught my attention! I could eat blueberries every day! I'll be trying these for sure. We love blueberry muffins, I’m giving this recipe a try this weekend! How could anyone not want to immediately copy a recipe called The Best Blueberry Muffins You'll Ever Eat? They sound wonderful -- and of course blueberry season is just around the corner. Maybe I should try making these with the sweet cherries I bought yesterday, but I might be pitting them till blueberry season! I’m with Mr. Cottage, as I like blueberry muffins better than blueberry pie. I have a blueberry recipe I always use BUT these sound amazing and look so yummy! Thanks for sharing. Just bought some awesome fresh blueberries ,baking these tomorrow,thanks. Love me some blueberry anything and these DO indeed look so good! These blueberry muffins sound delicious. Thank you for sharing at Friday Feature. The muffins look delicious! I’ll be pinning the recipe! Sounds yummy! Pinned and put on the grocery list! Carol what sort of world would this be if there were no blueberries? Muffins are my favorite. Thanks for sharing this lovely recipe.